Oxidation zone of the Yubileinoe massive sulfide deposit, South Urals, is buried beneath Jurassic sediments containing coalified plant remains. Mineralogy of gossan of this deposit is marked by the abundance of siderite. The carbon isotope composition (δ13C) in siderite varies from –20.0 to –23.4‰ PDB, which is close to δ13C variation in coals from the overlying sediments (‒23.5 to ‒26.2‰ PDB). 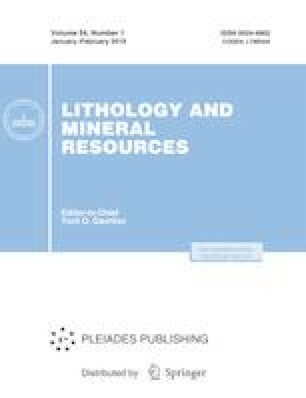 The formation of siderite is likely related to interaction between solutions of the Triassic oxidation zone and fermentation products of the organic matter. The authors are grateful to managements of the Bashkir Gold Mining Company, the Khaibulla Mining Company, the Uchaly Mining and Processing Enterprise, and the Bashkir Copper LLC for assistance in field works, as well as to A.D. Slukin for valuable remarks. Laboratory works were supported by the Russian State Budget Program (project no. AAAA-A16-116021010244-O) and partly by the State Task of IGEM, Russian Academy of Sciences.